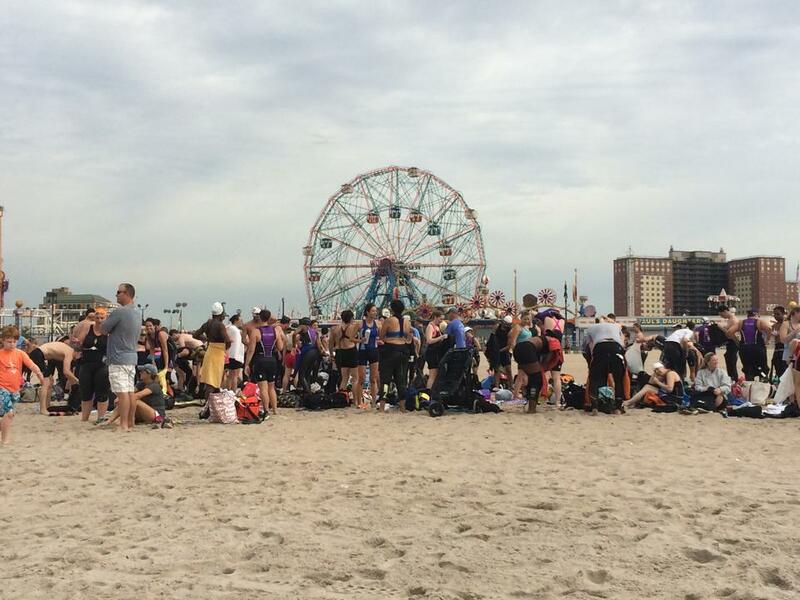 Coney Island, Take Two: Redemption – Countdown to the NYC Triathlon! 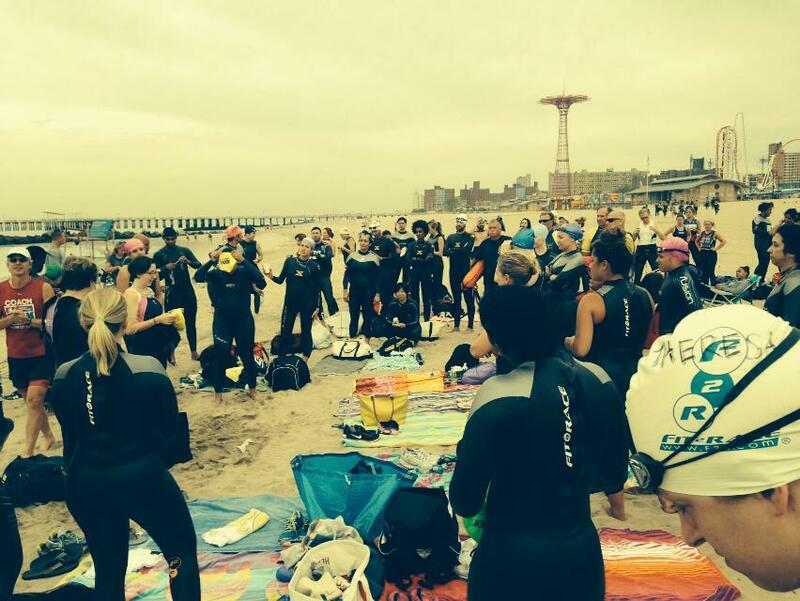 When we got to Coney Island, I immediately wished that I had a sweater and was glad to put on my wetsuit. It was 7:20am, cloudy and chilly and I was shivering from either the air temperature or my nerves. Or both. Such a little drama queen, right? Then it was time for the water. It was a bit warmer than last time, and this time around we just swam on our own within the group – no buddies to swim with. I high-fived one of my friends while we told each other than we would be fine and we ventured into the water, just after one of the coaches gave us all a warning that there were tons of jellyfish lurking about. For some reason it is hard for me to breathe out at first when I put my face in the open water. Maybe it’s the cold or the movement of the current or something, but I have to really force myself to breathe that air out for the first 3-5 times before I settle into it. But I think it could also be some kind of natural response to something – I find that I hold my breath way more often than I should when I am punching in Muay Thai, lifting at the gym, or even hitting a tennis ball. Then the coach told us that we would swim the rectangle for 40 minutes straight and that at no time were we to be in water where our feet could touch the bottom. I can’t imagine what the expression on my face must’ve looked like when he said that, but a wave of panic swept over me. 40 minutes? In the ocean. With the waves. In a place where I couldn’t touch the bottom. With the jellyfish. And the tons of other swimmers all around me. Ok. Maybe triathlons aren’t my thing. Maybe I got a little overzealous with this whole idea and am just not ready. 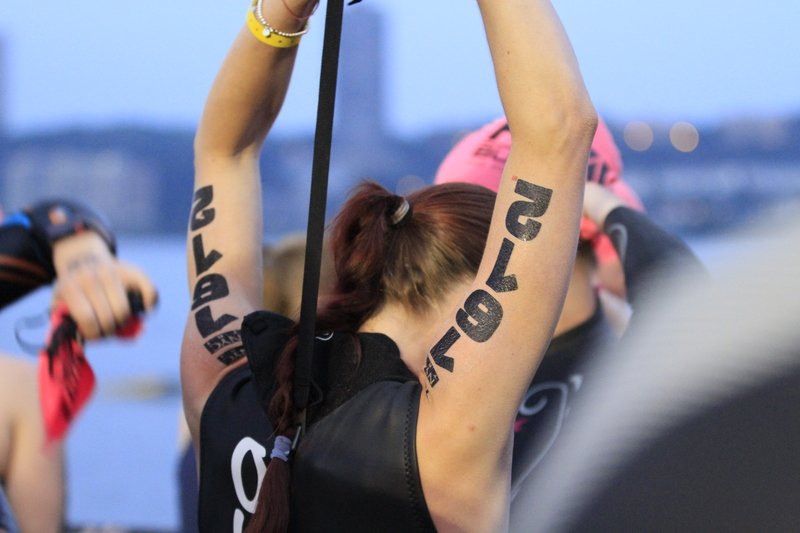 Maybe I’m a duathlon girl. Let me run a marathon instead. An ultramarathon, even. Is it too late to bow out gracefully? Tell everyone that I was just kidding about this whole thing? Admit defeat and move on? I swear I’m not always such a drama queen, but the thought of 40 minutes nonstop in the ocean brought out a 6 year old scaredy cat and I felt stuck between fight or flight. Luckily I am not one to admit defeat easily and was definitely not going to be the person to bow out. No way. I’ll fight over flight any day. The mantra that the coaches have been telling us since day one, drilling into our minds and repeating over and over again in weekly training emails came into my head. I am strong. I am alive. I will thrive. Not just survive. I took a deep breath and blew it out slowly. I am strong. I am alive. I will thrive. Not just survive. I loved being a little mermaid, but after some time I wondered how much longer until those forty minutes were up. I had done several rectangles and had no idea if 8 minutes had passed or 38. I was also a little nauseous from all the movement of the waves combined with continuously turning my head to breathe. I started the short leg of the rectangle and heard the coach whistle and yell that 40 mins were up – time to get out of the water! I got out of the water, quickly tried to turn my water legs back into land legs, reunited with my crew and got out of my wetsuit. I was freezing and shivering and my head was a bit dizzy, but I was smiling and ready for the 5 mile boardwalk run. I threw on my shoes, turned on the Nike+ app on my phone and ran. 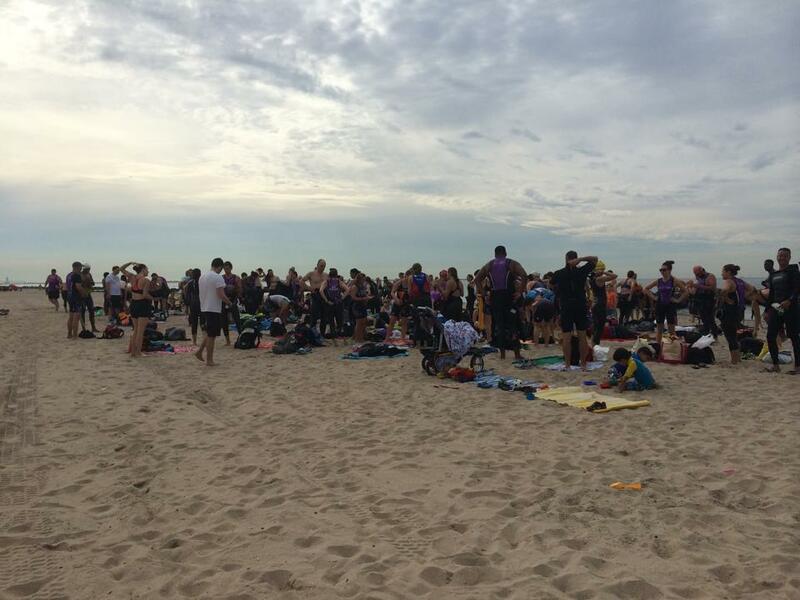 Since most of us had our race gear on under our wetsuits so that we could practice swimming in what we would be wearing on the actual day, the boardwalk was covered with purple LLS and TNT race tops, shorts, headbands, you name it. It was pretty amazing actually. I can only imagine how many more of us will be there on the actual day. So – the swim was a success, the run was great, and all that was left was fries from Nathan’s and a cold Coney Island Mermaid pilsner. Done and done. Triathlon day is less than 2 weeks away and I feel ready. 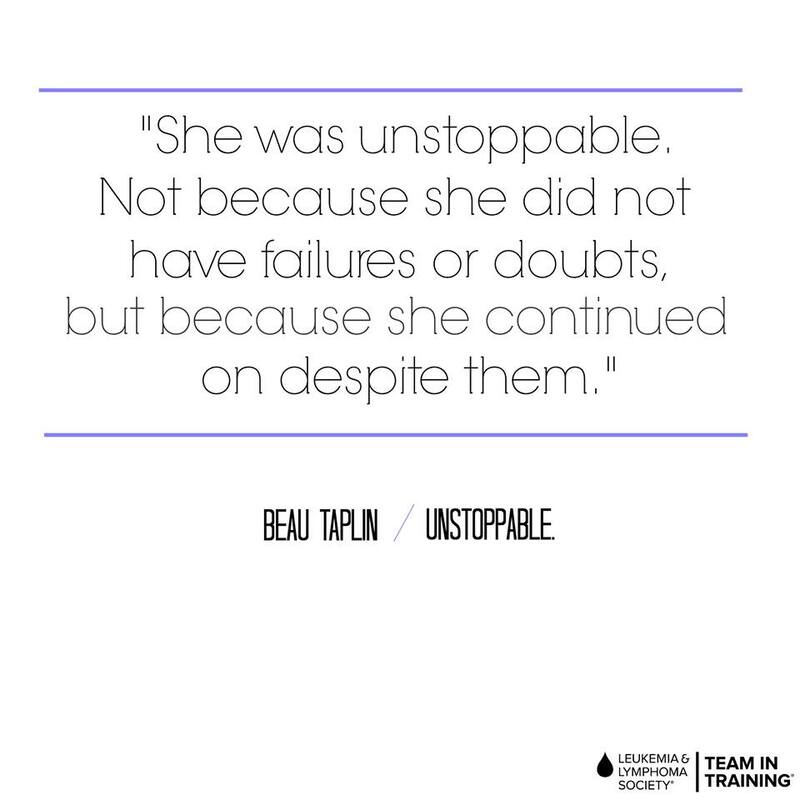 I am so excited to wear my purple, to jump into the Hudson, to get the adrenaline rush that comes with races (which I can only imagine is intensified for triathlons), to be a part of something bigger than I am, to swim, bike and run for my grandma, for the fighters, survivors and victims of cancer. To be able to say, after months of training, that I am a triathlete.